The Sunrisers Hyderabad outfit hasn't had the greatest of runs in this edition of the Indian Premier League and the fact that SRH has just three wins from seven games sheds light on the desperate need for the 2016 champions to conjure up a winning algorithm. That the Sunrisers made four changes in the playing XI and even then fell short of the Delhi Capitals did indeed bring out the shortcomings in the team, a brittle middle-order that collapsed as the Capitals picked the last eight wickets for just 15 runs. In David Warner and Jonny Bairstow, the Sunrisers have formed the perfect opening combination but the pressing concern will be the form of the middle order which boasts of the likes of Vijay Shankar, Manish Pandey but has still failed to click. Hosting the Chennai Super Kings for their next game, the Sunrisers will certainly be gunning to arrest their three-match streak but with the Super Kings producing a number of match winners over the ongoing season, the Sunrisers' fortitude will certainly fall under test. With three losses in a row and two of them coming at home, the Sunrisers can be expected to re-jig their playing XI yet again. Here is the probable playing XI that they could field for the crucial game against Chennai. David Warner will stick to his role as the opener alongside Jonny Bairstow. The southpaw will be coming into this game at the back of two important half-centuries and will hold the key for the Sunrisers against an in-form Super Kings bowling line-up. Jonny Bairstow has looked in fabulous touch in his debut season of the IPL with 304 runs from seven games and has made the most of the chance given to him at the top of the order. With the Sunrisers in desperate need for a win, Bairstow's aggression at the top will be pivotal. Kane Williamson did not enjoy a great comeback from injury as he fell to a single digit score and will be looking to lead the way against CSK. With an ability to farm the strike and switch gears, Williamson's contribution could prove to be handy for the Sunrisers. Vijay Shankar has made a couple of useful starts this season and has 132 runs to his name from seven games. However, with the Indian international unable to convert his starts into big knocks, the stylish batting all-rounder will be looking to reverse his fortunes. Manish Pandey could return to the side at the expense of Ricky Bhui and add some solidity to the middle order. With just 54 runs from five games, the stats do not paint a pretty picture for Pandey but his experience could come in handy against a potent CSK bowling line-up. Deepak Hooda has not had a lot of batting time in this edition and is yet to play out his role as a finisher to good effect. Barring his quickfire 3-ball 14 against KXIP, Hooda has not looked very comfortable and will need to pull out a top show against CSK. Abhishek Sharma picked up the crucial wicket of Colin Munro against the Capitals and will most likely hold on to his place in the XI. Sharma did give away ten runs but can be backed for yet another game with his ability to hit the long ball also bound to make a good case for the youngster. 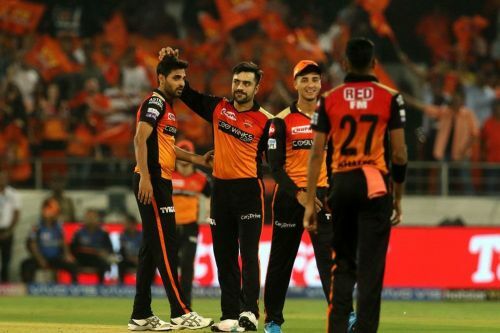 Rashid Khan has bowled his heart out for SRH this season but has been unfortunate to pick up just six wickets from seven games, with the batsmen looking to play out his threat rather than take him to the cleaners. However, Rashid Khan's economy rate of 5.79 is certain to give him the edge going into the game against the Super Kings. Bhuvneshwar Kumar has been a tad bit on the expensive side in this year's IPL but has still managed to stifle batsmen with his yorkers and slower deliveries. With the World Cup just around the corner, the seamer will be hoping to get his act right and trouble the Super Kings' batsmen. Sandeep Sharma's ability to swing the ball both ways has reaped him rich rewards as the pacer has picked up eight wickets from seven games and leads the charts for the Sunrisers. Bowling in the powerplay and at the death, Sharma has used his variations to good effect and will yet again play a big role in restricting the Super Kings' batters. Khaleel Ahmed was drafted into the side against the Capitals for his first game of the season and he took the opportunity with both hands as he priced out the openers from his first two overs, before accounting for the fall of Rishabh Pant. With momentum on his side, the left-arm pacer will be banked out to pile the pressure on the Super Kings early on. Probable Playing XI: David Warner, Jonny Bairstow (wk), Kane Williamson (c), Vijay Shankar, Manish Pandey, Deepak Hooda, Abhishek Sharma, Rashid Khan, Bhuvneshwar Kumar, Sandeep Sharma, Khaleel Ahmed.